St. Matthew Lutheran Church is happy to arrange for the Baptism of children and adults. Jesus Christ our Lord says in the last chapter of Matthew, "All authority in heaven and on earth has been given to Me. Therefore go and make disciples of all nations, baptizing them in the name of the Father and of the Son and of the Holy Spirit." This makes Baptism a Sacrament or a Holy Act. Baptisms normally occur during worship services. 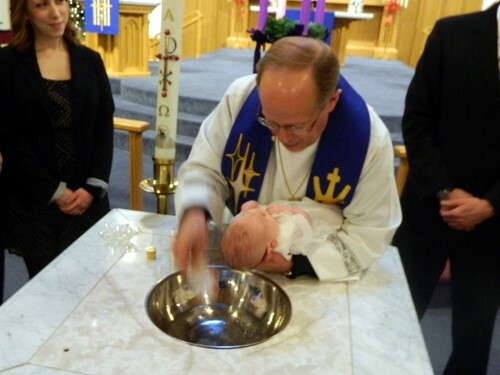 An Application & Information Form for The Sacrament of Holy Baptismal at St. Matthew will be sent to those interested in receiving the Sacrament. Those requesting to have their children baptized attend a pre-baptismal meeting with the pastor who will be officiating at the Baptism. Teenagers and adults normally complete confirmation instruction prior to being baptized. Call 847.438.7709 to begin the process and receive the Application & Information Form. You can also, CLICK HERE, for the application and email the completed form to pastorkinne@stmattsonline.com or fax to 847/438-0376. How Do I Arrange for a Wedding? Thank you for considering St. Matthew in your wedding plans. The privilege of being married at St. Matthew Lutheran Church is for those who publicly practice their Christian faith. Those interested in having their wedding at St. Matthew will receive the booklet “The Celebration of a Wedding at St. Matthew” and are then requested to meet with one of the pastors prior to setting the date. At that time, details regarding the wedding will be discussed. Participation in pre-marital counseling sessions with the officiating pastor is also expected. Call 847.438.7709 to inquire about the availability of wedding dates and to arrange for a meeting with a pastor. Weddings are scheduled on a first-come basis. A Wedding Request Form will be provided from the church office. It is to be filled out with as much information as available and returned to the church office as soon as possible. This form is kept on file. Information is added as it becomes available. A deposit of $350 is due at the time of scheduling this sacred event. One does not have to be a member of St. Matthew for a pastor to officiate at a Christian funeral service. Members of St. Matthew may choose to have a funeral in the Main Sanctuary, Historic Chapel, funeral home, or cemetery. Non-member funerals are typically limited to the funeral home or at the cemetery and may be arranged if there is a pastor available. Please Call 847.438.7709 for more information.